Christmas is getting close - have you finished your Christmas cards and shopping! I know I say every year I am going to start early, but of course I don't. I did get my cards finished and in the mail last weekend, but still have a few gifts to get. 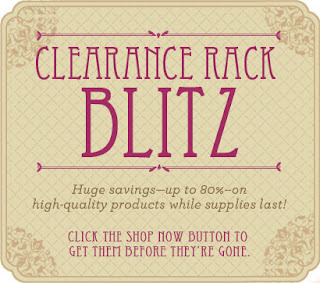 Nearly 200 new Clearance Rack items are being added to the Online Store at discounts up to 80 percent off retail--while supplies last! What a great way to stock up for the new year or maybe to get some gifts for your "stamping friends". 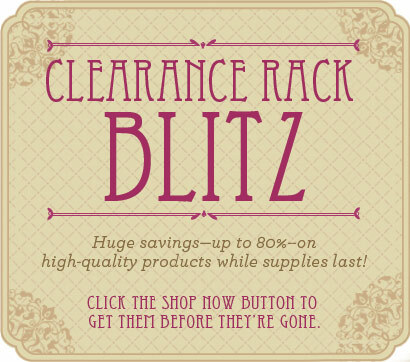 The Clearance Rack items are available through my online store only from December 15 to January 5. Have a look and if you have questions, email me or give me a call! Don't miss out on this great punch!